Seat belts: all the seat belts fitted are checked for type, condition, operation and security. All mandatory seat belts must be in place. Doors: Latch securely in closed position. Front doors should open from inside and outside the vehicle. Rear doors should open from outside the vehicle. 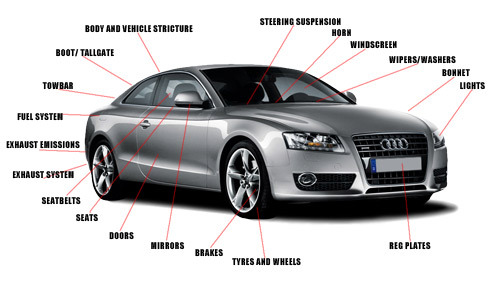 Brakes: condition including inappropriate repairs or modifications, operation and performance (efficiency test). Note the removal of the road wheels and trims are not part of the test. Anti-lock Braking System (ABS) and Electronic Stability Control (ESC) where fitted.Check of the dashboard Malfunction Indicator Lamp (MIL) for ABS, ESC, electronic park brake and brake fluid warning. Emitting Diode (LED) headlamps for cleaning, self leveling and security. Headlamp aim.